I am an online writer with a love for animals. I've been a member of many sites including eHow, Xomba, Helium, and now HubPages. 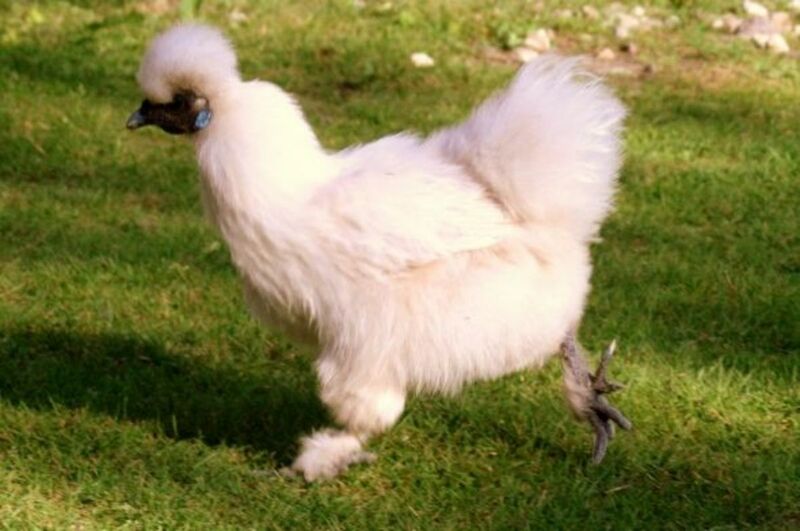 Silkies are a very unusual breed of chicken for many reasons. Below I list the traits that separate them from the rest of their species. 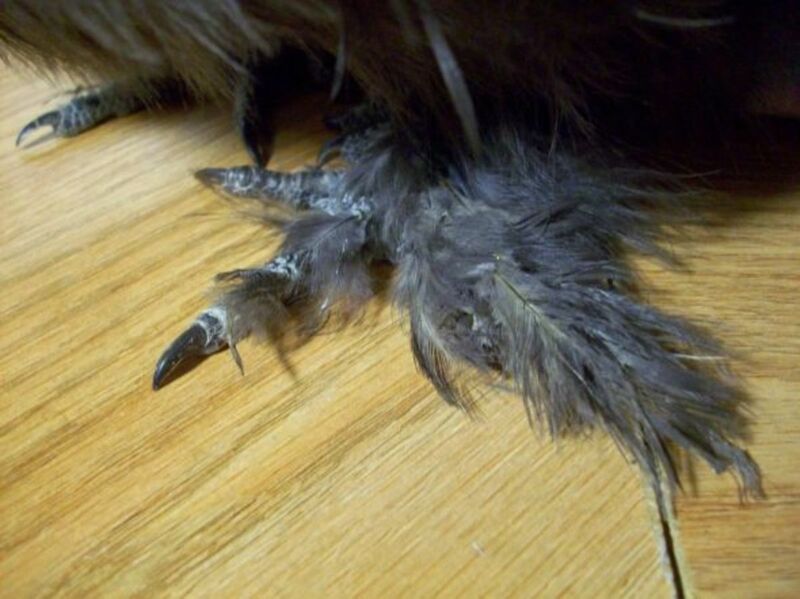 Some of these unique characteristics include having feathers that resemble fur, having black skin, and having five toes instead of the typical four toes on each foot. These birds are sweet and friendly, and they make wonderful pets for just about anyone. This is a chicken you would want to cuddle, and luckily for us, most silkies have such complacent personalities that they wouldn't mind it at all. Silkies in America are fairly small (about the size of a rabbit). 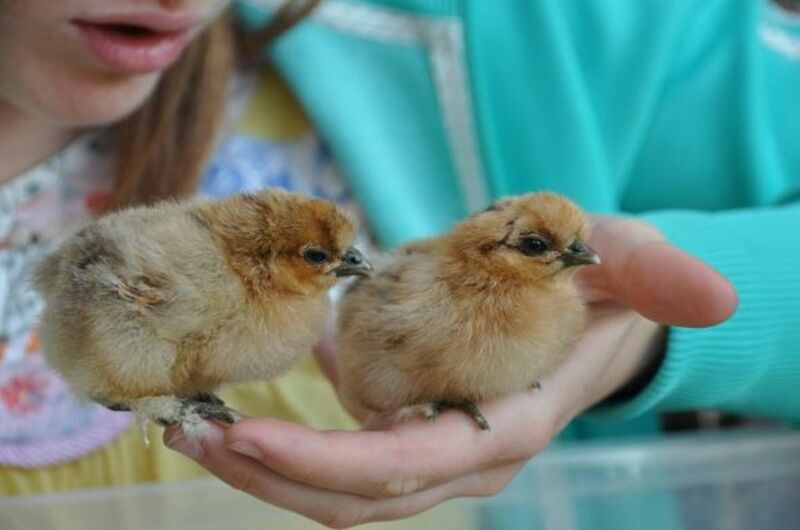 They are all called bantams (a term that means "miniature chickens"), and in general, they are between 8-14 inches tall. In other countries, however, there are two sizes of silkies: one that is a bit smaller than ours and a standard version that is a bit bigger than ours. 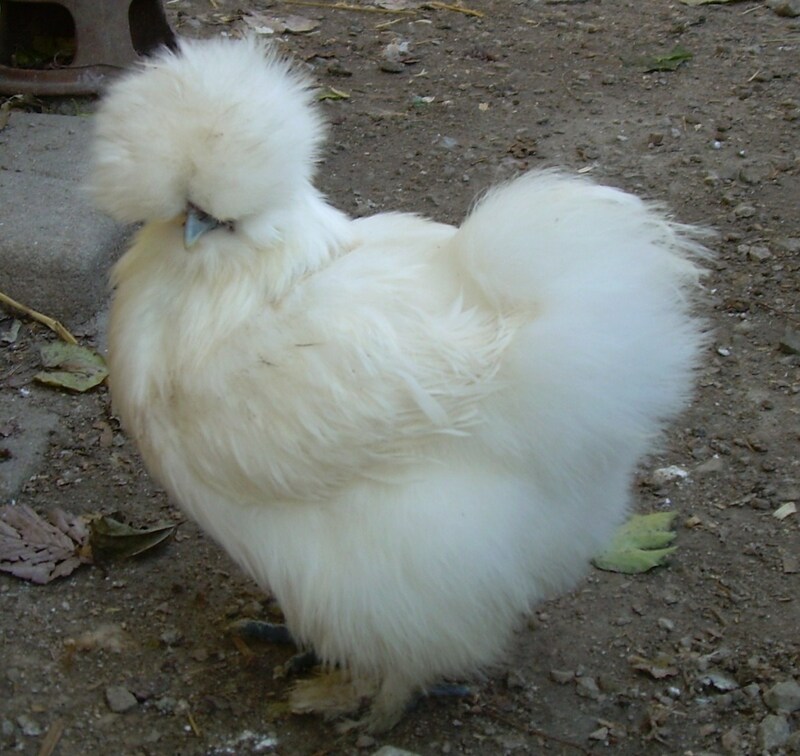 Overall, silkies are a fairly compact breed with short legs and roundish bodies. Silkies have feathers that are different from most chickens. If we look at a single chicken feather, typically we will find thick hairs growing on either side of the main shaft. These hairs are called barbs, and in most feathers, the barbs look neat and straight. If you look really closely, you can see that these barbs branch into things called barbules. These barbules are lined with tiny hooks called barbicels which act like Velcro and keep the feathers smooth and straight. 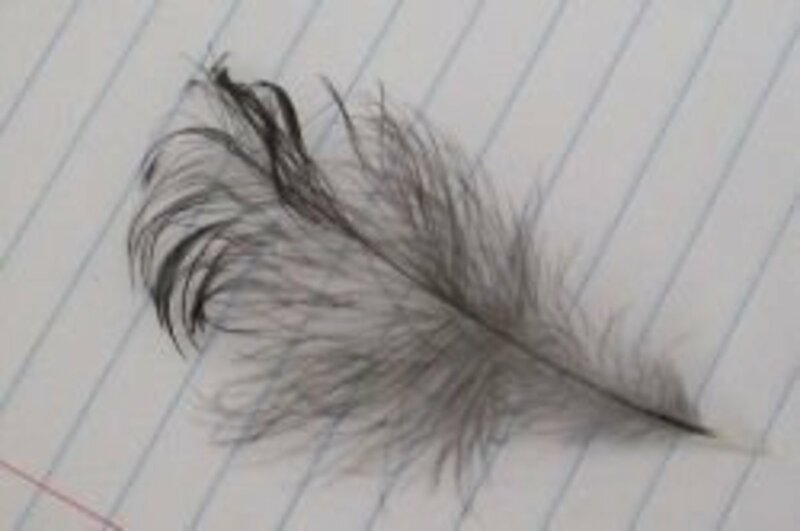 If you have ever played with a chicken feather, you will notice that even when you pull the little sections apart, you can make the feather whole again by brushing the barbules back into place. But silkie feathers are different. 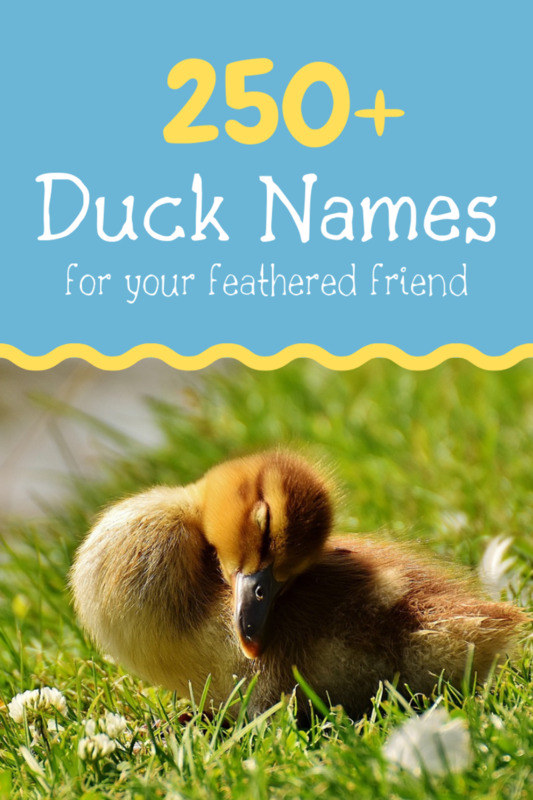 They lack the barbicels that keep feathers in that neat, smooth appearance. The individual feathers, hence, wisp around which makes silkies look messy and furry. Silkie feathers are, therefore, similar to down, the undercoating that most poultry have. These birds look like rabbits or balls of fluff. My favorite is when people describe them as fluffy slippers with feet. Silkies have a fun tuff of feathers on top of their heads, which will eventually grow out and just barely start curling around their faces. Underneath this little mound of hair lies a vaulted skull. 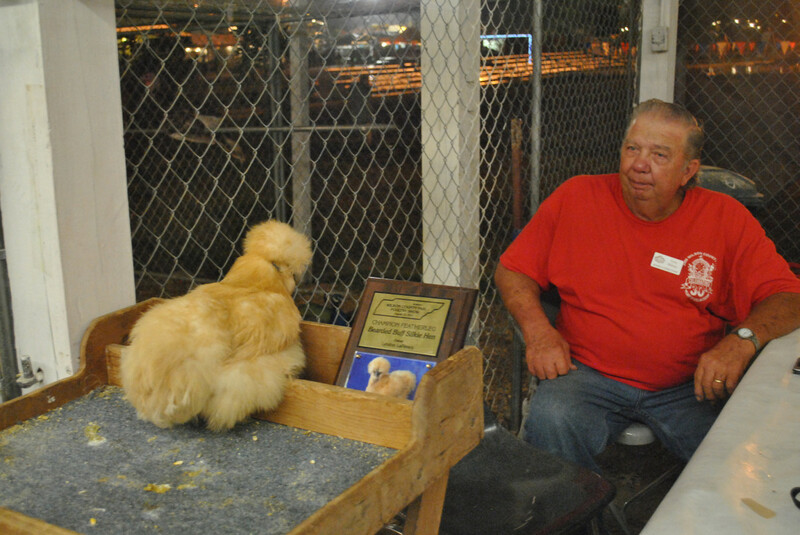 Good show chickens and some pet-quality silkies have skulls that are actually arched up at the top of their heads which leaves a vulnerable spot. If another chicken gives the silkie a good, strong peck on top of its head, it can actually cause neurological damage or even kill them. 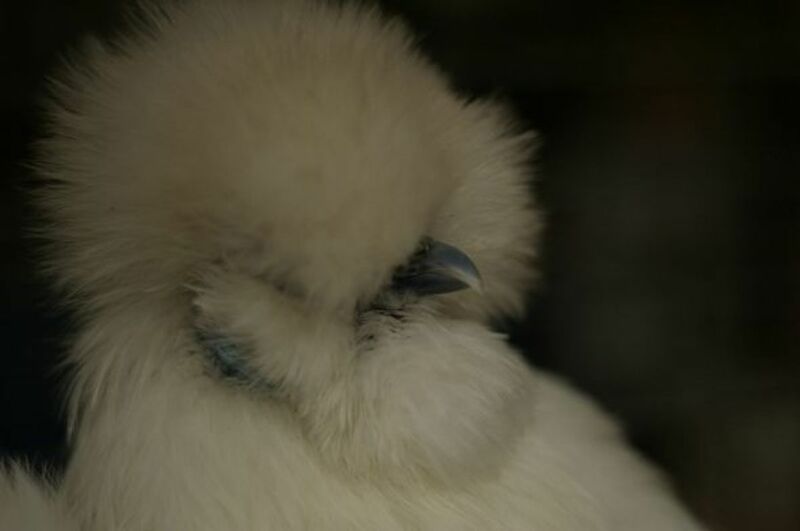 Silkies often have difficulty seeing because their puffy, feathery crest and other facial feathers occasionally obscure their eyes completely. Breeders usually handle this in one of two ways. They trim or pluck the feathers away from the Silkie's face if it does not need to be in top shape for a show. They pin the crest back using a hair tie. 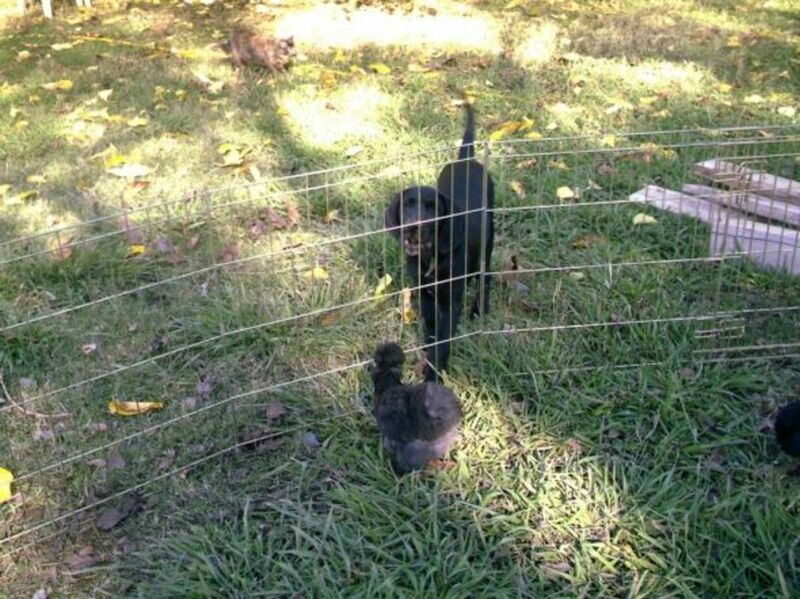 Done gently, this does not harm the feathers but still allows the chickens to see. 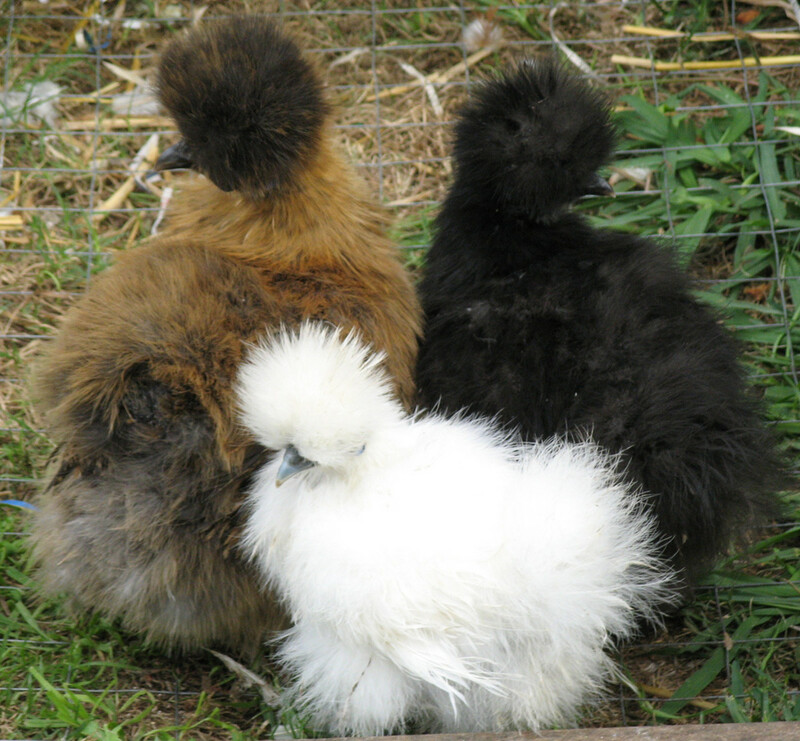 Silkies come in two varieties: bearded and non-bearded. Some silkies have a group of feathers on their chins which resemble beards, and others do not it. It all depends on the breeder's personal preference. Some people like the added fluffiness that the beards add to the chicken's face and others do not. 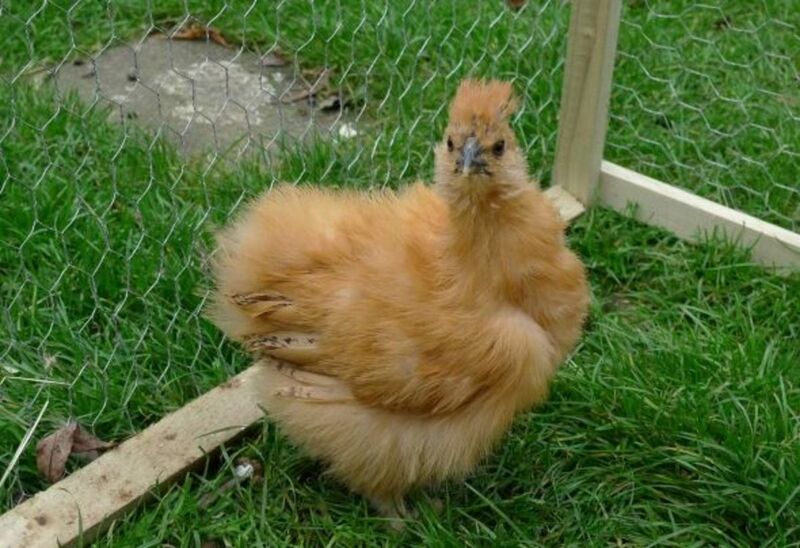 Unlike most backyard chickens which have yellow skin, silkies have black skin. Their skin is very dark, and this makes them a popular delicacy in some Asian countries. It also makes them wonderfully colored. If their feathers are black, then the black skin underneath makes the feathers look blacker. If the silkie is white, the black skin underneath makes the white deeper. They also have dark, purplish-black combs and wattles. This shade is called mulberry. It can sometimes be difficult to see the combs and wattles against their black skin, but I think it makes them look really cute. 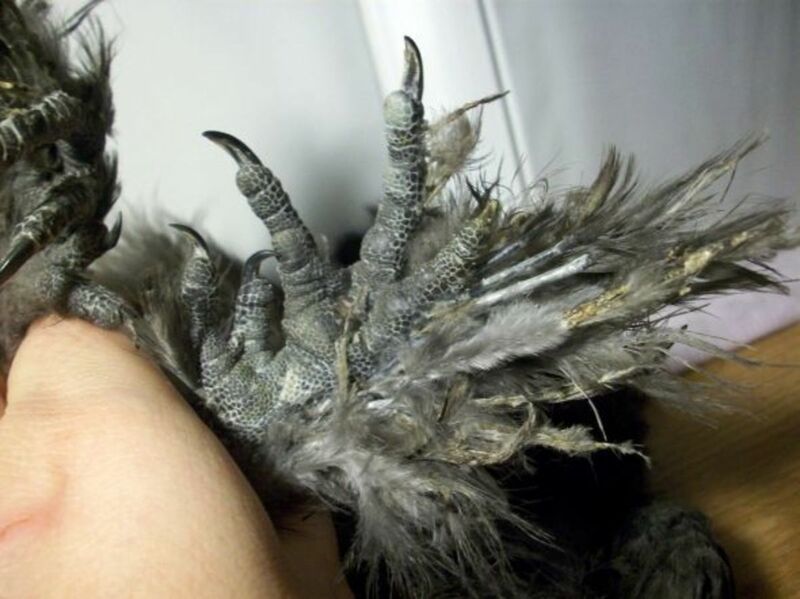 Silkies have feathers growing on their feet. This can sometimes be a problem if they regularly walk into muddy areas or have a non-wired cage bottom. They will clean their feet feathers as they do all their feathers, but show birds need to keep their feet clean at all times. Even if they aren't going to be shown, it's best to keep them in a somewhat clean area and provide a perch for them to sleep on at night so their feathers stay clean. Most chickens have four toes, but silkies have five toes on each foot. Some, however, are born with fewer toes, or as is often the case, fused or partial toes due to a common genetic mutation. If you are keeping them as pets, it doesn't matter how many toes they have. But silkie breeders have to work hard to make sure their chickens have the right number of toes, otherwise they will get disqualified at shows. Most hatchery-breed silkies are lower quality, and the majority of them have improper toes. Silkie roosters have walnut-shaped combs. Dark skin is an important breed characteristic, but wattles and combs vary a little bit. They should be mulberry in color, but it's not uncommon for hatchery birds to have poorly-shaped combs. Some silkies have earlobes with a beautiful turquoise sheen. Aside from the regular solid colors, they come in several patterns, including cuckoos, partridge, and splash. 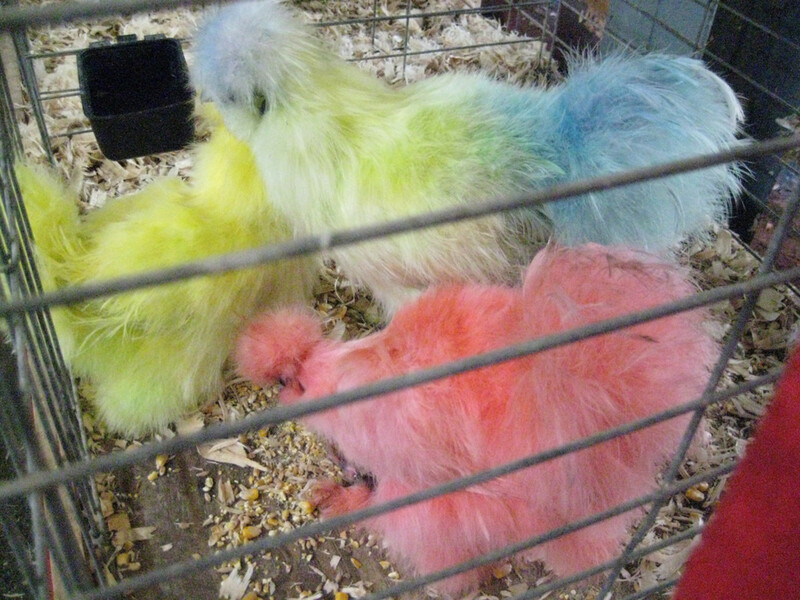 If you are not happy with the way your silkie looks, you can color them with food coloring. As long as food-safe colorings are used, it doesn't hurt the bird and is really fun. I think the chickens even get a bit of enjoyment out of it too because they get more attention and cuddles. Silkies aren't well-known for their flying. At best, it's usually more of a controlled fall, though some don't even do that well. All silkies are somewhat capable of flying, but it takes quite a bit of energy, and most don't bother or know how. It's always best to place perches low so they can get up and down without straining themselves. Also, never drop them onto the ground as this will hurt them. It's better to set them down gently. Though they may not be the most intelligent of the chicken breeds, silkies make up for it by being the most gentle and sweet. 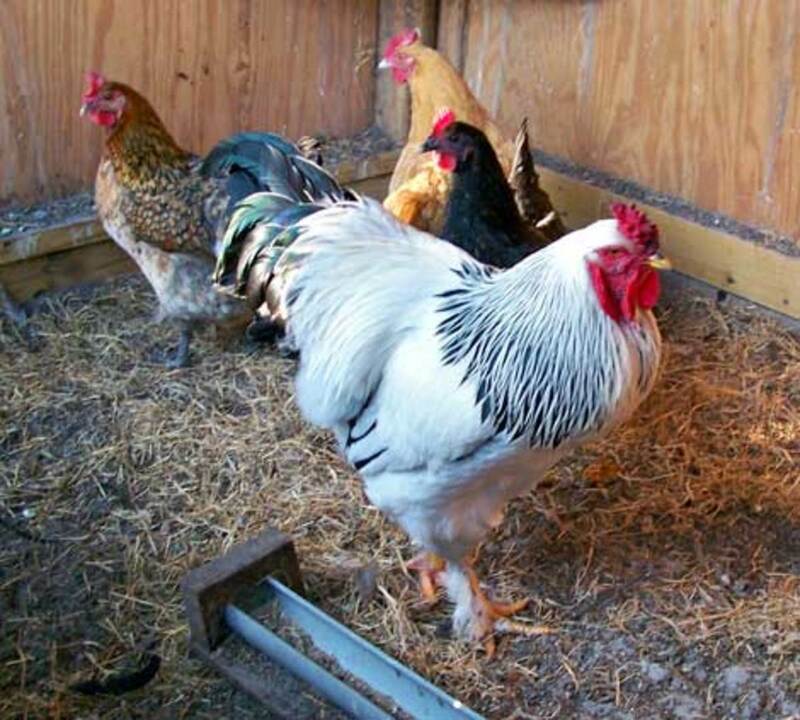 They are extremely laid-back and easy-going, so they make great pets, even for those who are not used to chickens. This is why they are one of the most common chickens for 4-H kids and petting zoos. If they are used to being handled, silkies will often let you do just about anything with them. Some people even leash-train them. I have personally taught them to ride in the car and get carried around. Silkie hens are often wonderful mothers. They love to sit on eggs (this is called broodiness or being broody), even ones that are fake or aren't fertile. This can be a problem if you learn to expect a lot of eggs from your silkie because she will stop laying when she is being broody. There are various ways to break this broodiness. One option is to place the hen in a wire-bottomed cage away from the flock for several days. But often, it is better to just let her be broody and give her some eggs to hatch. 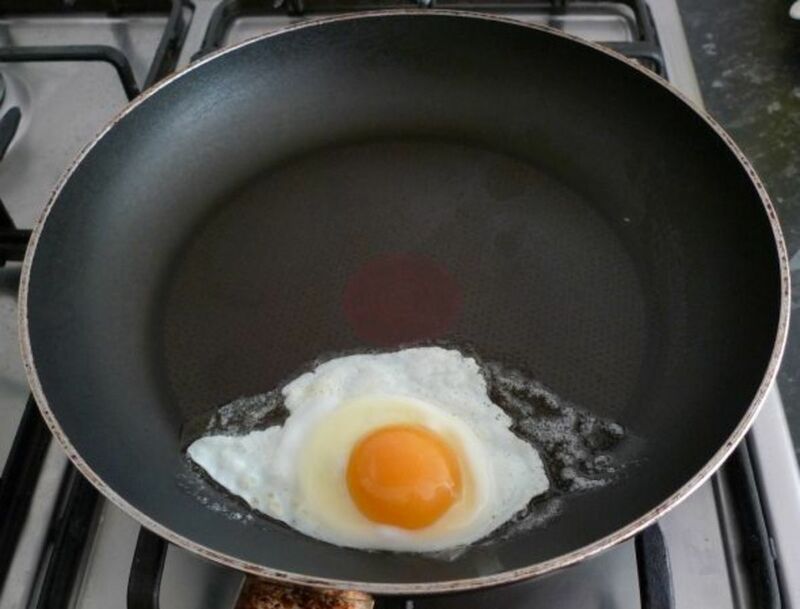 The eggs can be from other chickens or even other poultry. Those fluffy bottoms make great egg-sitters and in less than a month, you'll have cute little chicks with a beaming mama leading them around and showing them the world. 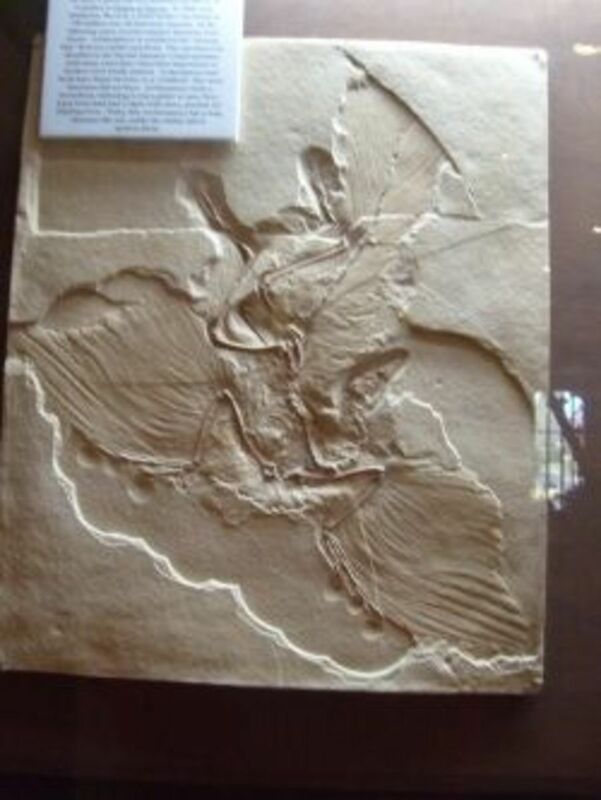 Although their origins are shrouded by time, we know they originated somewhere in China or Asia a very long time ago. They may look like a new-fangled fad breed, but silkies are one of the few ancient chicken breeds we still have around today. It is believed that Marco Polo spoke of the silkie when he wrote about fur-covered chickens during his travels to the Far East, back in the 13th century. Those fur-covered chickens were not a rarity or novel thing back then, so we can deduce that they had most likely been around long before the 13th century. 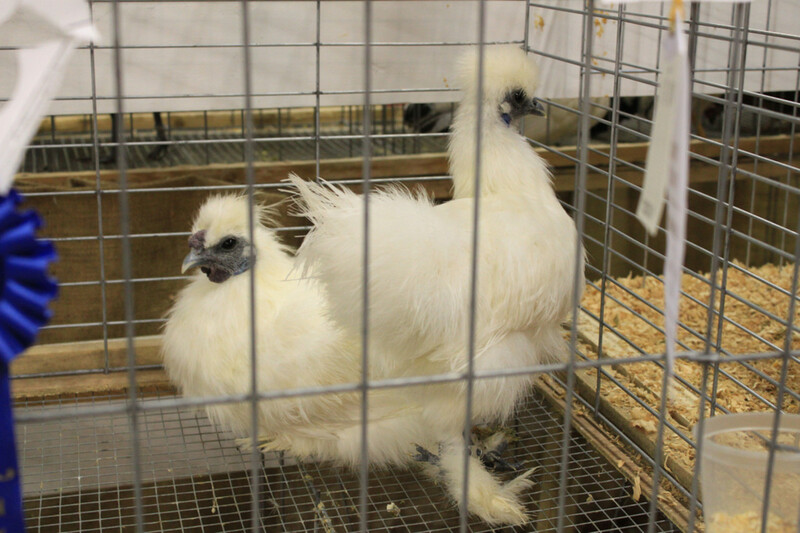 Silkies truly are an heirloom chicken breed. Silkies make absolutely wonderful pets for most people. Their easy-going and mild personalities, in addition to their hardiness and pretty appearance, make them easy to care for. 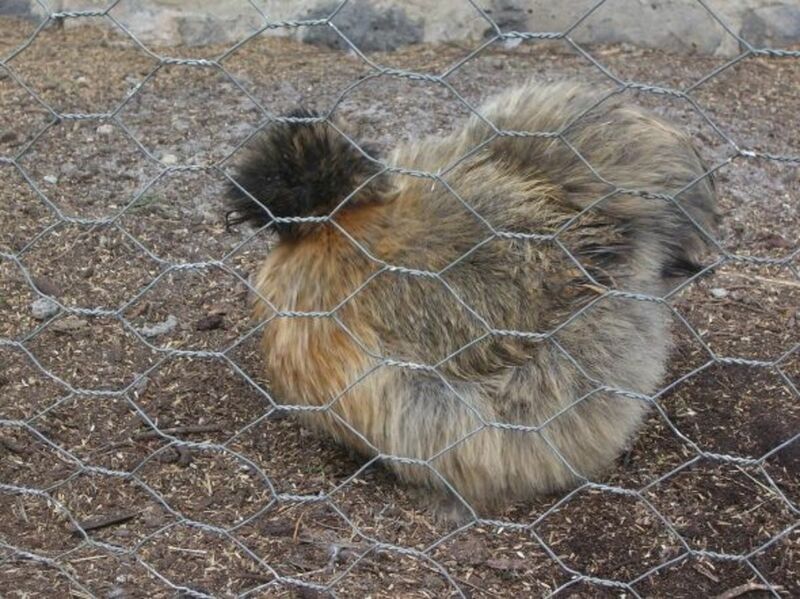 Also, because silkies are bantams, they're small enough to easily house. In fact, I had one that lived in a rabbit cage in my house when she wasn't roaming free in the house. Children also feel comfortable with them because they are small. Silkies, like all chickens, produce a lot of dust. They will produce dust all year long, but there are certain times when they produce more dust than others. As you may already know, chickens produce more dust whenever they're growing in their feathers. Dust is created when the shafts protecting the feathers flake off as they grow out. 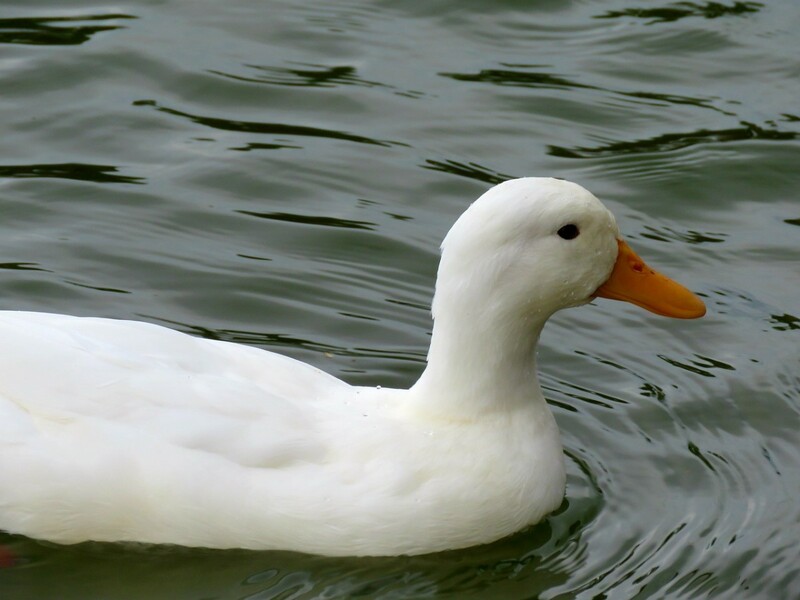 Springtime is the time of year when there is an outbreak of feather growth, but the main time for molting (losing feathers and replacing them) is in the fall. In the fall months, chickens usually replace most, if not all, of their feathers, and thus, produce lots of feather shafts which in turn flake off and produce lots of dust. Young silkies also go through periods of molting as they grow and gain their adult feathers. It is sometimes difficult telling them apart, but bunnies and silkies get along great. In the above picture, the little silkies and their rabbit pals are enjoying the nice spring weather while playing in the sunshine together. It's best not to keep silkies and bunnies in the same cage, but they often do okay as friends outside of their cages. Care must be taken to prevent the bunnies from having to hop through the chicken poo. A wire base on the cage usually helps. You should also ensure that they will get along. Pregnant bunnies or brooding hens can be aggressive, and both will become territorial when raising young. Chickens pant to cool off, but they don't sweat. The inability to sweat makes it difficult for them to adjust to hot weather. Like all chickens, silkies need some time outdoors where they can soak up the sun and eat bugs and grass. Though their little bodies are fairly resistant to the cold, silkies are sensitive to high temperatures, so care needs to be taken to ensure they have enough cool water to drink and that they can retreat to shade if need be. When the wether is about 100 degrees or above, they will need extra cooling. You can use a mister or a fan, but some people go the extra mile by providing air conditioning in the chicken house. Silkies lay eggs that are slightly tinted with brown. These eggs are on the small side because silkies are bantams, but they still taste just as good. Due to the silkies' tendency to be broody, there may be interruptions in egg-laying. So if you want a chicken just for the eggs, it may be better to get an egg-producing breed, such as a White Leghorn. Silkies take 21 days to hatch after an egg has started to be incubated, though there are reports of some taking a few extra days due to uneven incubator temperatures. The chicks hatch out of their eggs slowly, pecking at the eggshell from inside using a small attachment on their beak called an egg-tooth that falls off a few days later. 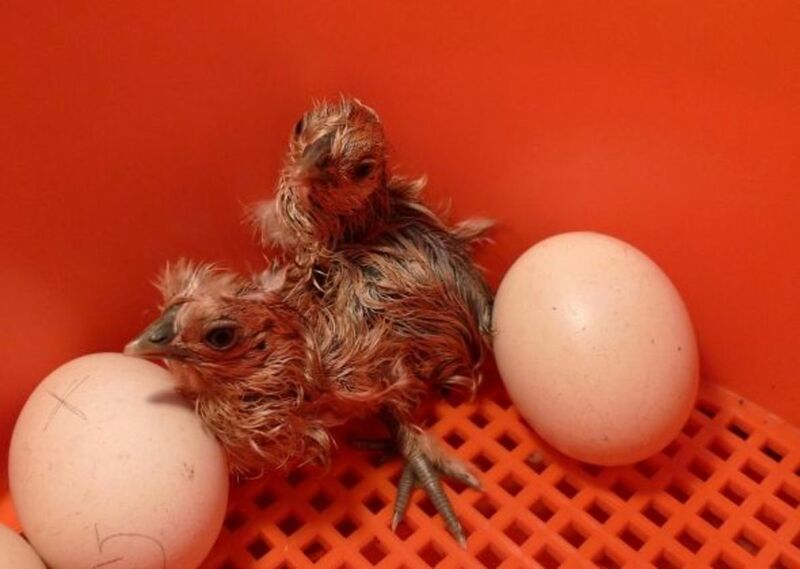 It is important not to help them while they are hatching since doing so can cause them to bleed to death. Hatching is a very long process and often takes an entire day for the little one to peck a crack and then break out of the shell. When the chicks are finally out of their shells, they are left in the incubator until they are dried and fluffy. This also helps keep them warm before they move to a box where they have chick feed, water, and a heat lamp. They live in the new box for about 6 weeks until they have lots of feathers and can handle cooler temperatures. The chicks are then moved to their new home in the coop. Depending on the outside temperature, this may be delayed until spring when it will be warmer for them. In the coop, the silkie chicks grow and grow and reach adult size at about 3-4 months. Along the way, they get tons of new feathers and will shed their old ones, as well as leave a lot of bird dander all over the place. Often times, you can't tell whether silkies are male or female until they start laying eggs or crowing at about 6-7 months. Roosters usually develop a comb a bit earlier than hens do, but not always. It is nice to pin back or trim the silkies' crests so they can see better. They are actually surprisingly hardy considering how fancy and delicate they look. Each silkie needs about 10-square-feet in their run area and about 4-square-feet inside their coop. More space leads to fewer problems, as cramped birds will pick on each other. 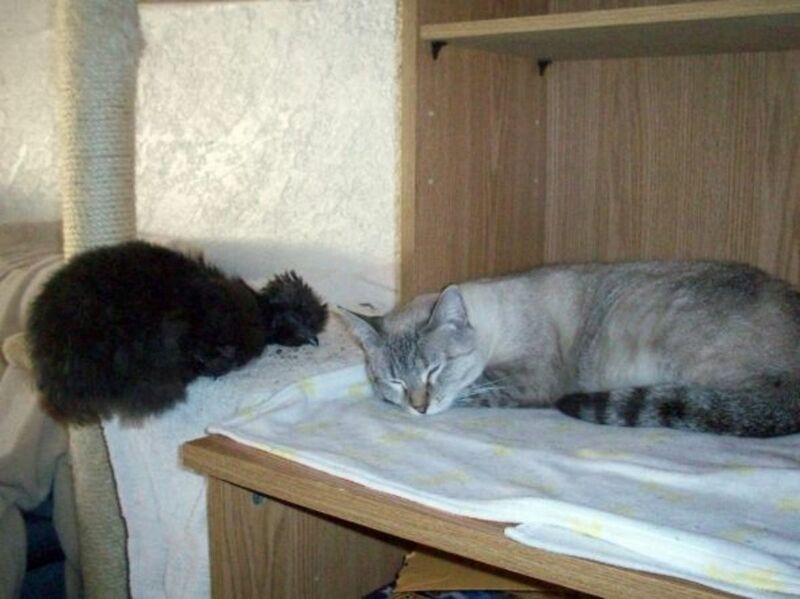 They don't like perching, so will often make a big fluffy pile on the floor. Beware of these piles though — if it's too cold and they burrow too much, they can suffocate. Rabbit hutches make adequate enclosures for a couple of birds, but it is a good idea to build an attached run onto them and make sure that the bottom of the cage is not completely wire as that can irritate the birds' feet after a while. In my experience, I added a perch and a door to a dog house and placed that inside a chain-link dog kennel for a quick and easy chicken coop. Whatever you do, remember to consider predators. There are far more predators around your house than you think. Another idea that works well is to keep the silkies as house pets. This way you can really bond with them. Otherwise, if you already have chickens or are planning to get a flock, they can simply live in the coop with everyone else. Like all chickens, they need regular dust baths to keep their feathers nice and mite-free. They'll make their own spot, if allowed, near the dirt. If kept caged, it's a good idea to create a mini dirt puddle in an old box using either sand or dirt. Just be prepared — it's a messy business. Due to the fluffiness of their crest, silkies can have a difficult time in the world. With limited vision, it's very easy for them to roam too close to predators and be surprised by an attack. The most common predators that attacks chickens are our own pets, so care should be taken. With that said, silkies do get along well with animals that are used to chickens and will often make friends very quickly. Always be cautious when your silkie is near other animals. Sometimes, the seemingly friendly puppy could inadvertently go overboard when playing with your bird. One playful bite can chicken in an instant. Don't loose a bird or get mad at your beloved dog. Supervise play time and everyone will be safe. Remember, it's your job to protect them. There's a lot of debate over whether to keep silkies with other chickens. Silkies, with their mild personalities, passive attitudes, and impeded vision, are extremely vulnerable to bullying by other chickens. That being said, mixing chicken breeds depends on a lot of variables. How aggressive the other breeds are, the birds' individual personalities, and how much room the birds will have all influence whether or not it will be a good situation. 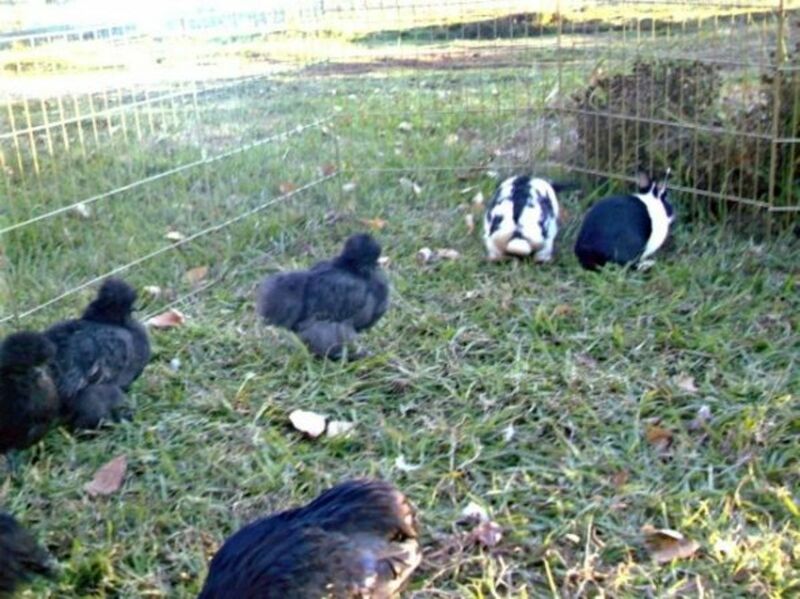 Most breeds do fine with silkies if given enough room to avoid each other. 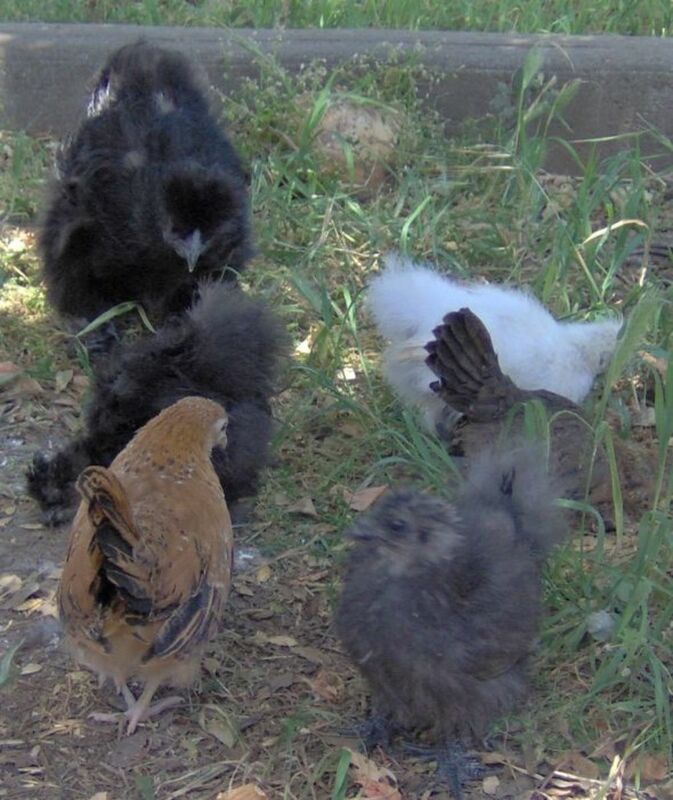 I have never had any problems with silkies and other breeds getting along, and have had a great many breeds with them. But if you're worried, the best way, in my experience, is to introduce chicks of other breeds to your adult or half-grown silkies. You may have to protect the chicks for a while until they're accepted as part of the flock. 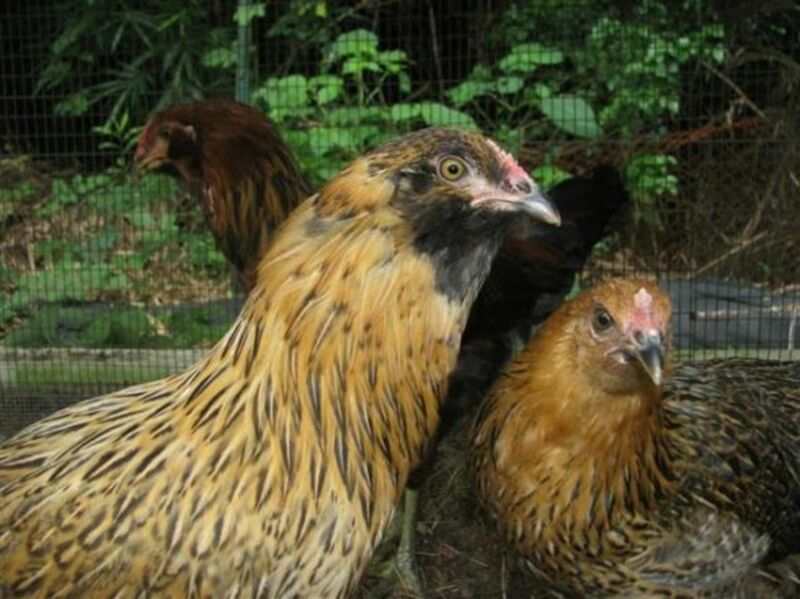 If you want a mix of chickens, it is best to raise other breeds with silkies. They get along better when they have grown up together. Silkies are generally as easy to raise as other breeds of chickens, but there are a couple differences. The most important difference is dealing with the poofy feathers. The feathers can get in the way of a hen and a roo, so it's best to trim back any feathers to make sure the rooster can make contact and leave his deposit. Another difference is that it's okay, and even preferable, to have a few more roos per hen. One rooster per 3-4 hens is a good ratio. Often silkie roosters get along with each other fairly well, so it's not too much of a hardship, and their slightly lower fertility rates are offset with an extra rooster or two. The roosters often make good daddies anyway, and the extra rooster can help watch the chicks too. Silkies are very popular and there are numerous groups devoted solely to them, as well as some that are about bantam chickens or all chickens. For more about raising, breeding, or showing, check out the groups below. Joining a group allows you to read advice from other silkie owners, lets you know exactly what to expect, and gives you a place to talk about these wonderful little birds. Some groups are solely online, others are by mail, and a few are groups that regularly meet. 1. The American Silkie Bantam Club is the original Silkie Club in the US. The ASBC is a large group devoted to raising and breeding silkies. Show breeders and pet breeders both find a place in this organization. 2. 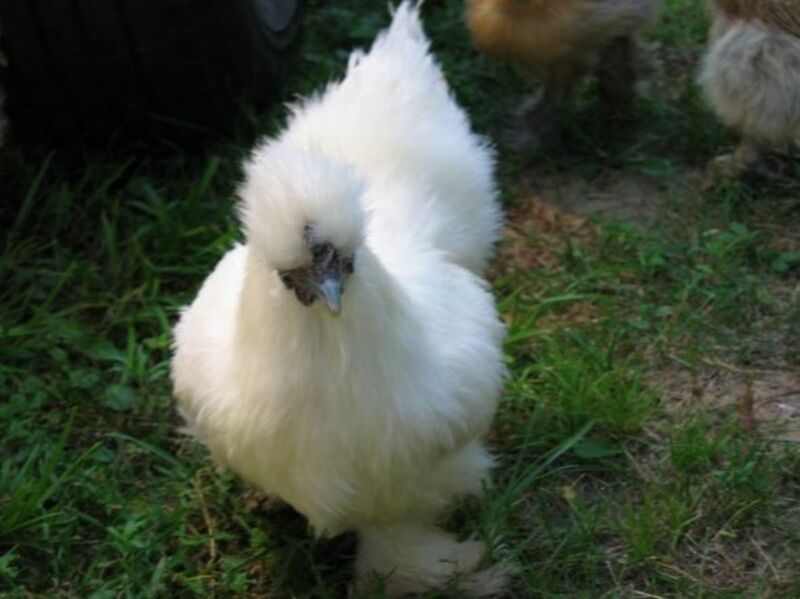 American Silkie Bantam Discussion Group is a free email list. The list includes members from Europe, Australia, and a few other places. Participation in the discussion group is free to any silkie fancier registered with the discussion group, not just American Silkie Bantam Club members. Silkie fanciers of all degrees of knowledge and expertise are welcome. The list includes a large number of show breeders as well as those who keep them solely as pets. 1. The Silkie and Poland Club of Germany Good photos, breeders list, contact information, and lovely sketches. Be sure to check out the website of the club secretary, Friedel Schwager. It is listed further down the page under "Great Silkie Sites From Around the World." 1. Silkie Club of Australia, Inc. has no official web page. However, the link is to an "unofficial" page with some useful information about silkie breeders in Australia and the Silkie Club of Australia. To contact them write c/o Secretary, Sue Scott: 6 Colville Rd; Yellow Rock, Australia 2777 or email them at silkieclub@optusnet.com.au. 1. Silkie Breeders Yahoo Group is for breeders and exhibitors. This list is for serious silkie breeders and people interested in exhibition. 2. 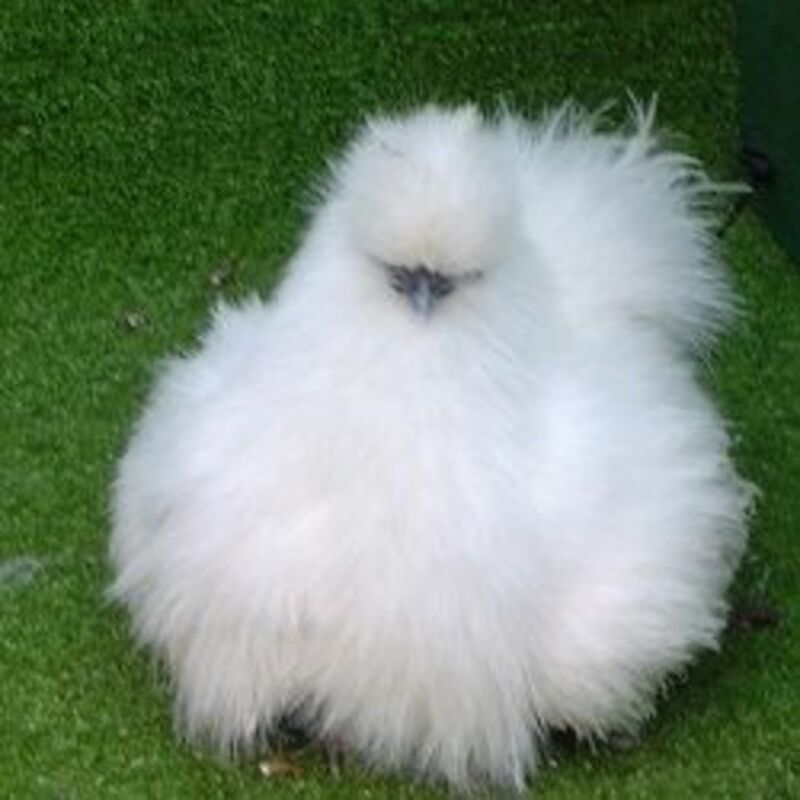 The Awesome Silkie Bantam Chat is a large friendly list with an extensive archive. This group is a good source of information for beginners. 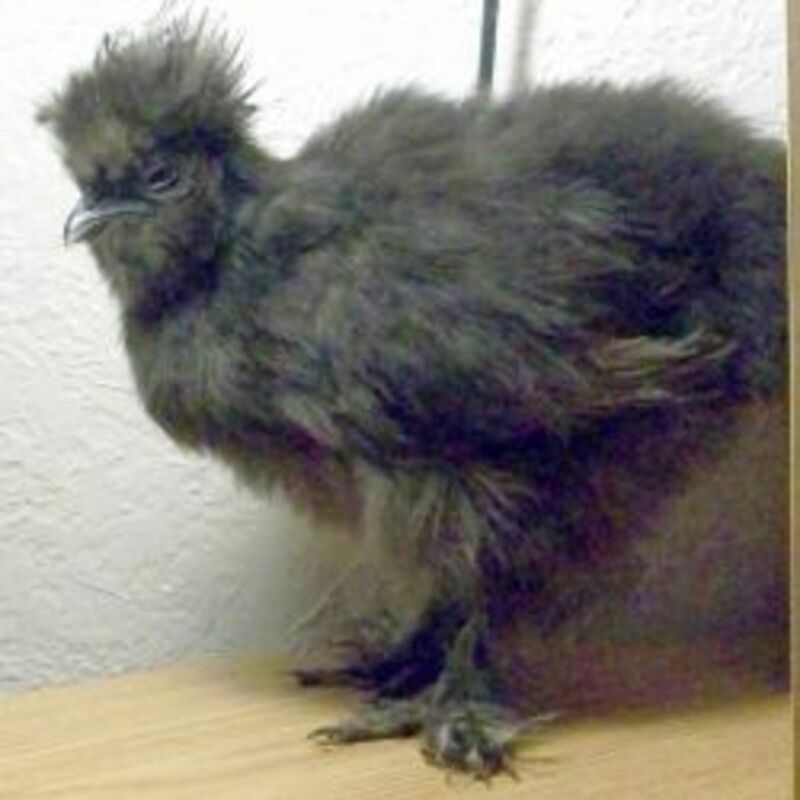 What would cause a 9-month-old silkie chicken to suddenly not be able to walk or stand? It eats and drinks and doesn't have diarrhea. There are numerous reasons your chicken might be unable to stand or walk. With their vaulted skulls, Silkies have exceptionally delicate heads. This means that if they get pecked in the head it can cause them to have enough damage that they lose their balance or can't stand. There's also something called Marek's Disease that causes balance loss and paralysis. It is most often evident when the chicken has a twisted neck and a low-hanging head. If you can, get your chicken to the vet. But if you are unable to do so ensure she keeps eating and drinking well since not being able to get to their food and water is usually what ends up killing them and more water may help flush potentially-paralyzing bacteria from their systems. Many times chickens are able to start moving over time as their bodies do a good job at recovering. When do Silkies start laying eggs? My hen is about 8 months old and still hasn’t laid an egg. Silkies usually start laying around 6 months, but all egg laying is influenced by the seasons. Nature makes chickens lay more in the spring and less in the heat of summer or the cold of winter. This can be a problem for us if we get new chicks in the spring and then autumn comes and makes them not lay just when they were about to start. You can make your chickens think it is spring all year long and encourage egg-laying by providing supplemental light to increase the "daylight" to 12 hours a day. 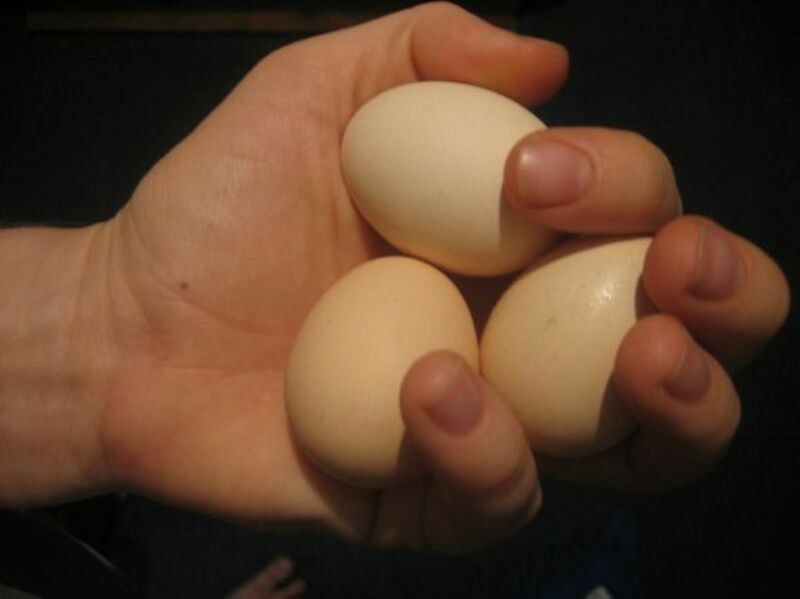 Also, make sure there is always plenty of food as shortages can also impact egg-laying. Other stressors, such as nearby predators will as well. Another possible cause for not finding eggs is that chickens are excellent at hiding eggs, so it's not uncommon to think they aren't laying, but really there's just a pile of them somewhere unexpected. How did you train your silkies? Chickens respond well to training when they get food treats after they do their tricks. Clicker-training, like the kind used on dogs, is also effective. Start small by asking the Silkie to do something it would want to do anyway, then when it does it swiftly click your clicker and give it a small treat. Keep doing that until it associates the clicking sound with getting a treat. After that, the sky is the limit. 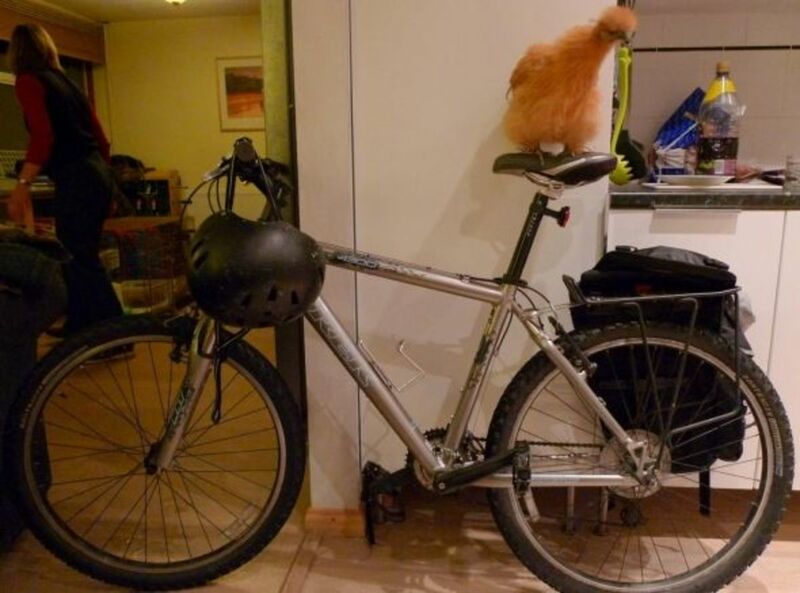 Most chickens will do anything to get a treat, and if that means jumping when you say so or even doing weave poles, the Silkie will soon learn to do it. Because Silkies have such puffy faces though make sure they can see well before you begin since if they can't see what you want them to do, they can't do it. There are some really good training videos on YouTube with people training chickens. Definitely check them out before you get started. 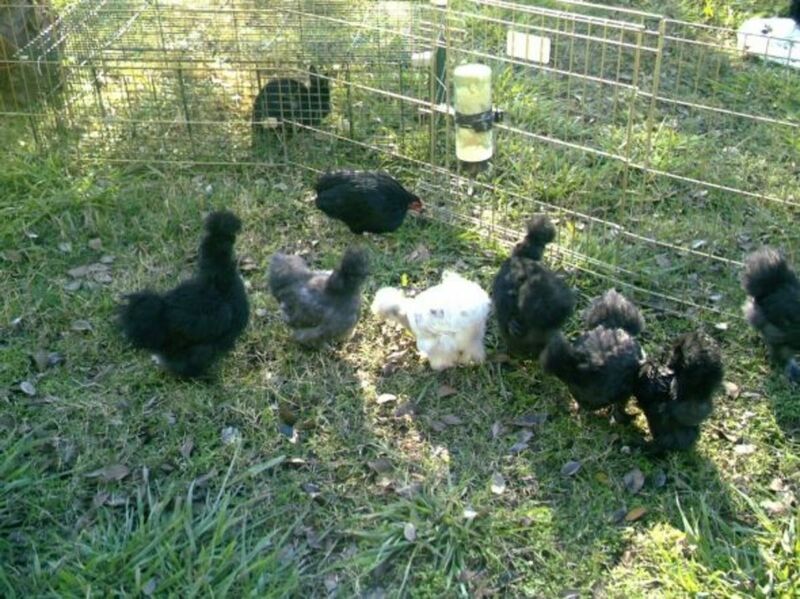 I brought home a new silkie rooster and two silkie chickens and put them in my coop. I already had one silkie chicken. This morning my rooster did not crow. Why is he not crowing? Some Silkie roosters don't crow much. It just depends on their personality. Also, because it's a new space, he may be reluctant to claim it as his own yet. Eventually he should start crowing at least a little. But he may not. 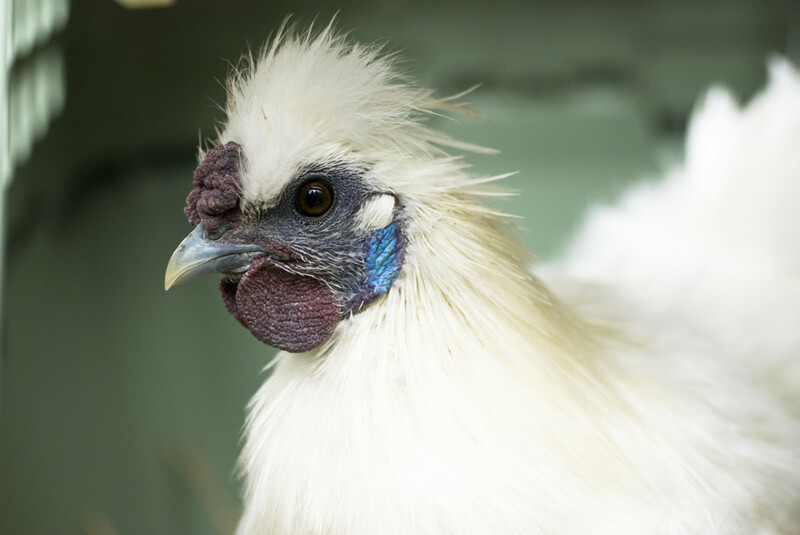 What are the causes of vestibular disease in Silkie chickens? Silkies have a unique skull structure. It is called a vaulted skull. Their skull projects upward instead of being as rounded as most animals' skulls. This gives them a more beautiful crest, but can also be a source of danger. Chickens peck each other, and as we all know, pecks can hurt and draw blood. When a Silkie is pecked at the right spot on its head, it can cause brain damage, leaving the Silkie unsteady, off-balance, walking in circles, or with its head cocked to the side. Sometimes it even kills the Silkie. It is not uncommon for Silkies to have this happen, but luckily chickens have great recuperating powers, and if helped to eat and drink, eventually they will usually recover. All chickens scratch. It's part of being a chicken. How many eggs do silkies lay each month? 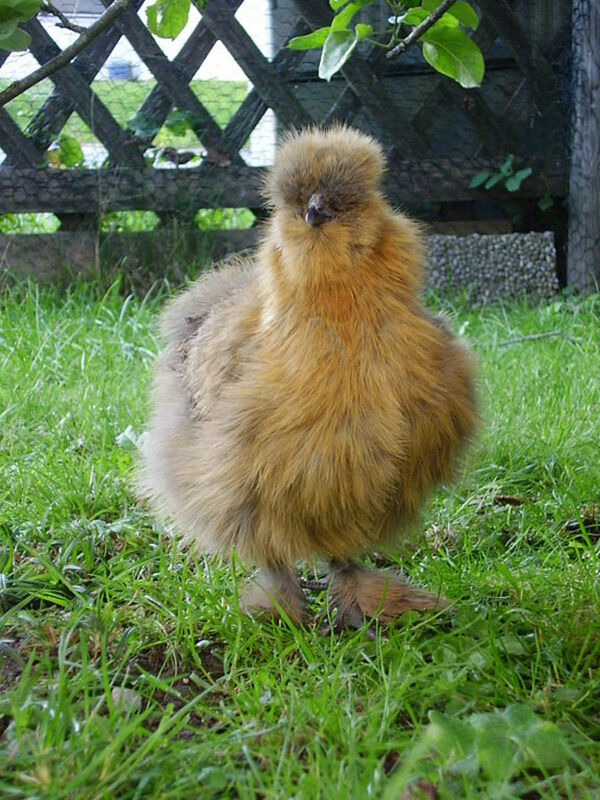 Silkies, like other chickens, tend to lay more during spring and summer. During these times they'll likely lay about 20 eggs a month depending on the hen, her genetics, and whether she is happy or stressed by heat. The average over the year (with heat/light during the winter) would probably be about 15 eggs a month. How long do silkie chickens live? 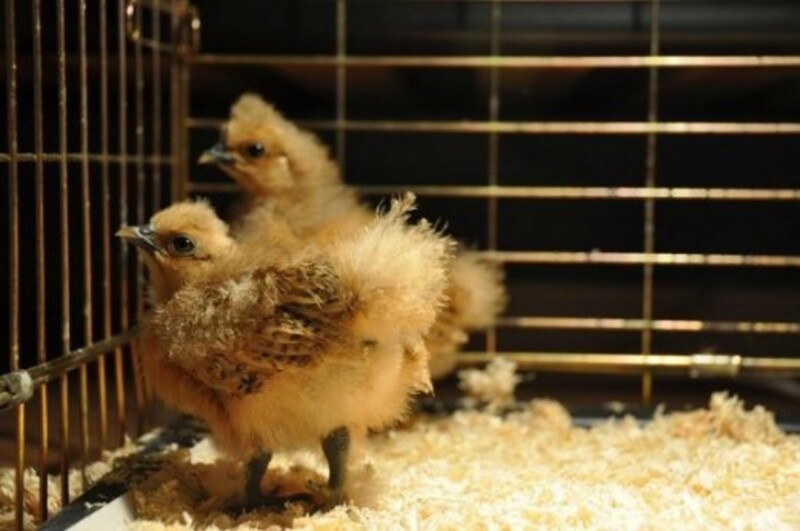 Most silkie chickens live 7-9 years, but they sometimes live longer with extra care. How many body parts does a silkie have? How many body parts total? In that case it would be similar to how many you have give or take some unique, species-only pieces. If you mean like when someone is cutting up a frying chicken, it would be the same as any other chicken--wings, thighs, breast, drumsticks. At what age do Belgian Splash silkies get their spots? 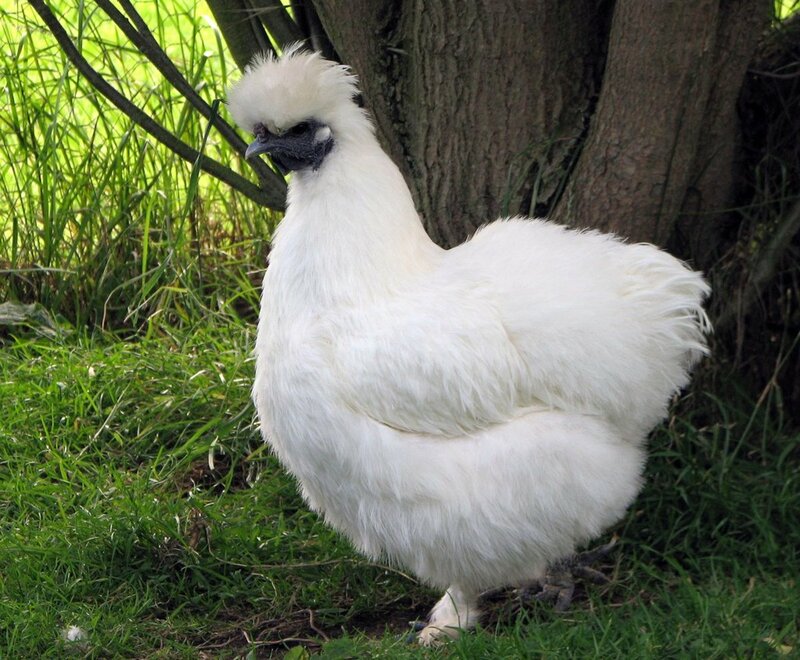 I've never heard of a Belgian Splash Silkie. It might be a new type or perhaps a mixed breed. 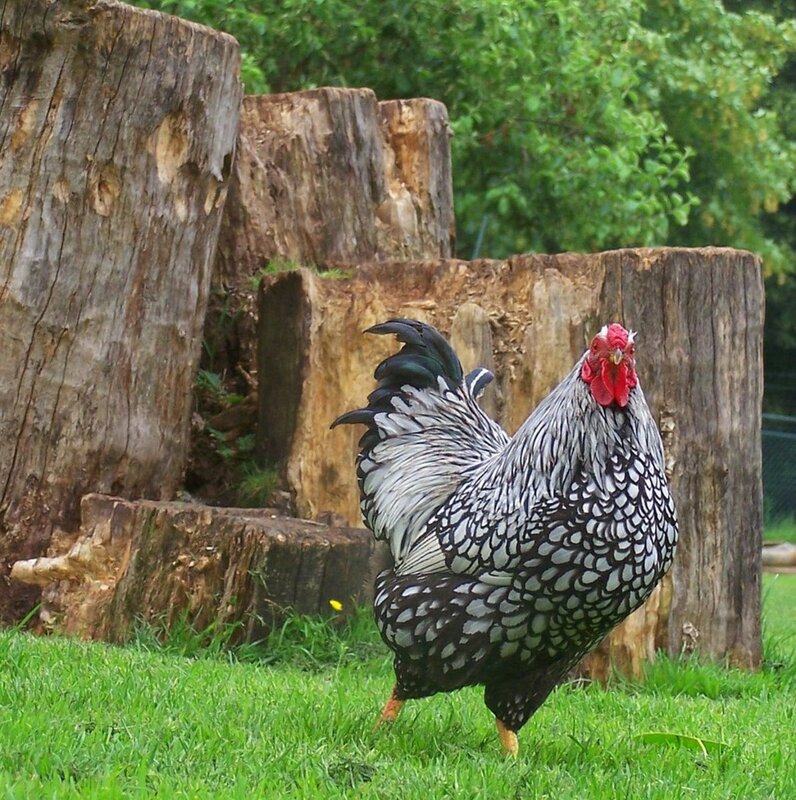 There is another breed of chicken called Belgian d'Uccles. They are very small and have feathered feet, but their feathers are smooth, not furry like Silkies. One of the most popular feather patterns of d'Uccles is called Mille Fleur and it sort of looks like a dramatic splash of dark brown and white splatters on a base of light, reddish brown. I'm sure someone somewhere is making a cute mixed breed by combining them with Silkies, but I haven't seen it. Both Splash Silkies and Mille Fleur d'Uccles will develop more of a pattern after their first molt. What antibiotic ointment can be used in Silkie eyes? I have an issue with the eyes closed & brown discharge. I washed with water, and it helped, but I heard ointment is good to use as well. Neosporin Ophthalmic Ointment is often used for eye infections in chickens, but I believe it is no longer over-the-counter. Regular Neosporin (without pain reliever) will work. While it says on the package not to get in eyes, it was actually recommended to me by an eye doctor and has the same ingredients as the one for eyes. With Silkies, it's also important to trim their feathers around their eyes as that is usually the cause of the infection. Also, keep them away from dusty bedding and be wary of chickens attacking them while their eyes are hurt. My silkies are pets and follow me, and they let me rub their back. I like silkies they stay fluffy for life! I have silkies all cross bread (all my 33 chickens are, apart from two iser browns.) Ones grey with a black head looks and like a tiny emu. I have a few. They are awesome, unique and really sturdy animals! @anonymous: That's wonderful that you were able to save her! She might have pulled her feathers out or is a mixed breed. Either way, she sounds cute! Do silkies ever NOT have feathers on their legs? My son found a juvenile chicken/turkey-like bird, alone on the side of the road at night. White feathers with black skin, gray/black beak and legs, 5 toes, poofy tail - but no leg feathers. Cutest thing, friendly, and needs attention! Thank you! Nice lens! We used to have a black one named Elvis. So soft. Must pet. Great lens! Nice lens. You put a lot of work into it. Adorable! I never knew about silkies. Great lens. Thanks for sharing! 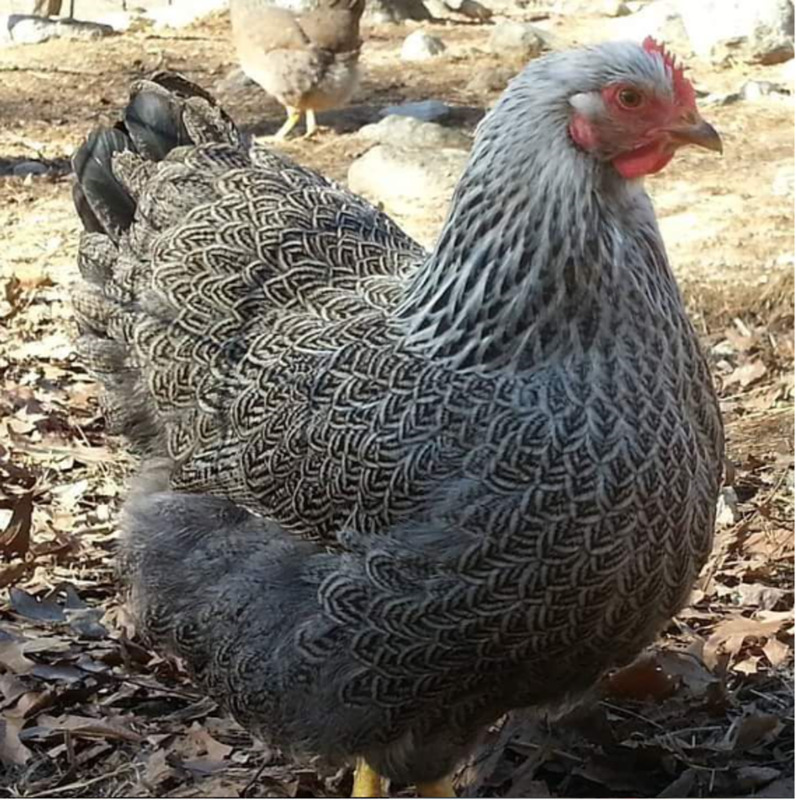 Sometimes I run across a show that has these silky chickens on them. Nice that you have put together so much interesting dialogue about them. Thanks! Very cute! I've never seen chickens like these before. I wish they laid bigger eggs though. Furry chickens - so cool! Great lens!! You did such a good job and I love Silkies. I always have at least one in my flock. I love Silkies and they have always been a part of our flocks. Enjoyed reading your lens. Thanks! Loved the lens and learning about Silkies. I love this lens. These little Silkies are just adorable, and you cover the subject very well. Blessed. Terrific lens. 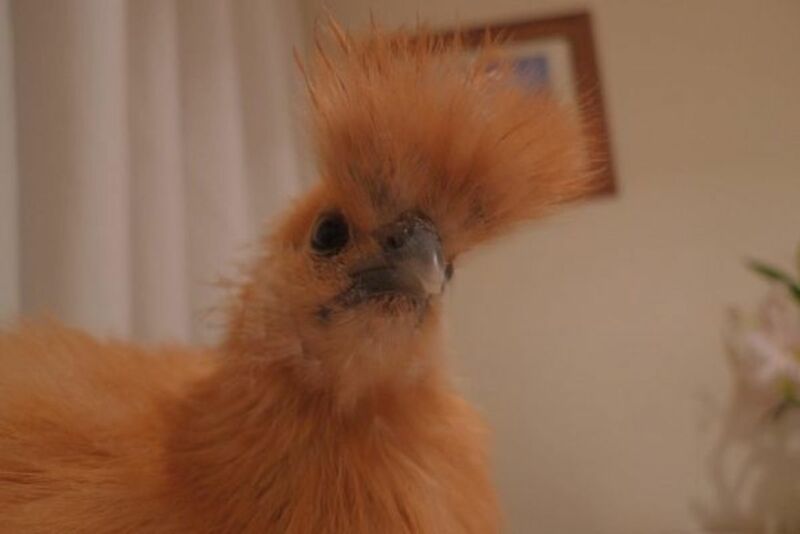 My friend used to have three silkies and I always thought they were adorable. I especially liked their black/blue skin. You created a great and informational lens, keep it up! Very thorough lens. Happy Chicken Day and well done! 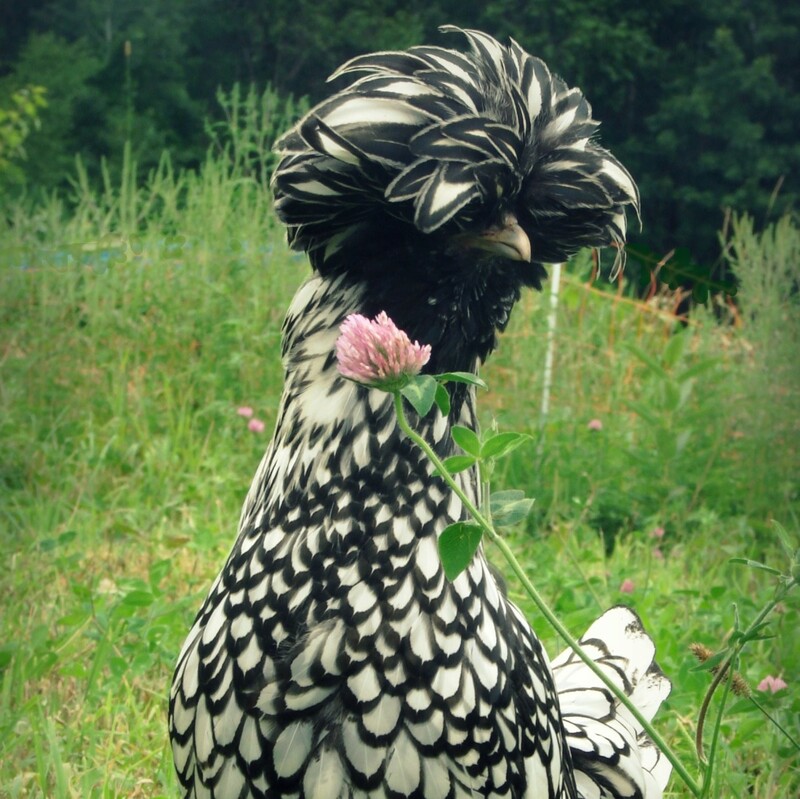 I love Silkies and Polish chickens, too. I think we can't keep bantams in our city, though, only standard size or bigger. I never knew about silkies until just now. They are gorgeous! Thank you for teaching me about this variety of chicken. Appreciated! Silkies are the best! I breed them on the ranch and they are described as fluffy poodles. Just silly birds! Wonderful looking Chickens. 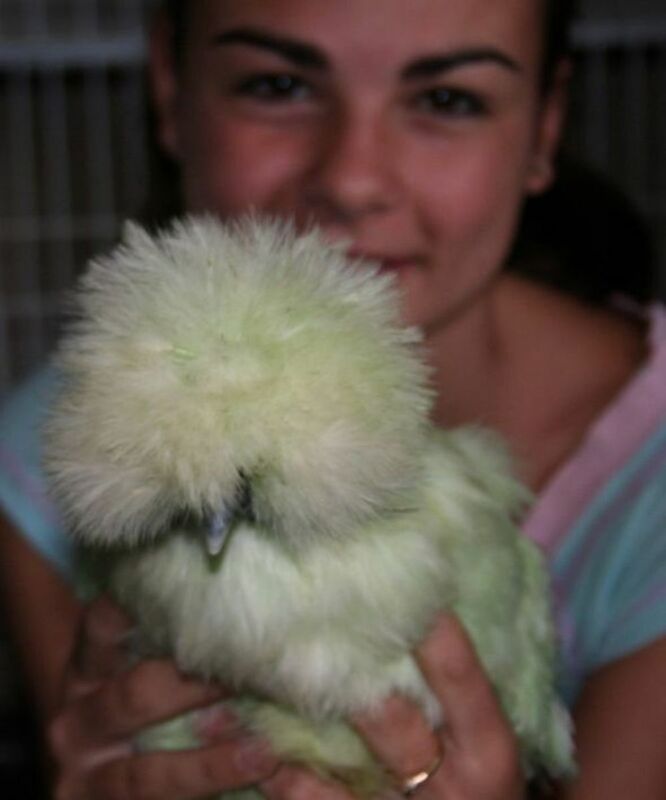 I think I want a Silkie now! Ah, just have to get a little acreage first though. Sweet Tweets nice, I have to say I have seen pictures of these types of chickens before, but I never knew the name of the breed. I really like the way these chickens look, I guess this breed of chicken makes for a great house pet. You have some great recipes here, information on building a Chicken Coop. Nice resource on Silkies. They are beautiful.